Dreams. What are they and why do they fade as quickly as they appear in the mind? Where do the images, colors and sounds of our dreams originate? And how do these subconscious visions percolate deep down into the cordial cores of our beings, in both sleep and waking life. Dreams have been a consistent theme in art, music, film, philosophy and literature since the beginning of time. 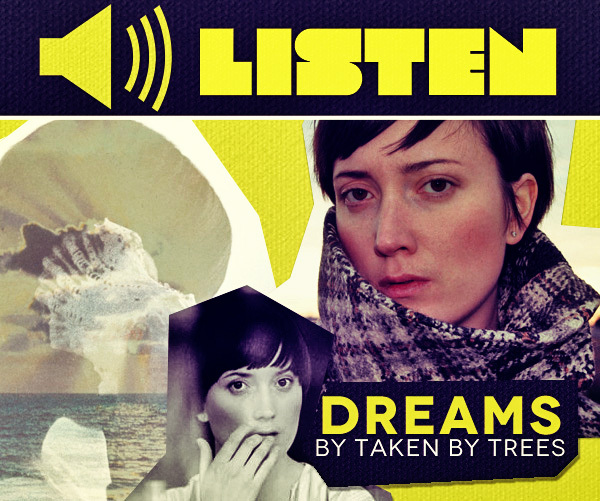 The track “Dreams” off the ethereal solo project, Taken By Trees, by Swedish songstress Victoria Bergsman, dives into the mysterious depths of the subconscious, letting all the ephemeral mystery and real pertinence of dreams come alive in blissful electronic ecstasy. “Dreams” is off her upcoming album “Other Worlds,” set for release on October 2, 2012. As the former lead singer of the band The Concretes, Bergsman has made a name for herself by her soothing voice and philosophically attuned disposition within songs. Dreams can be frightening, inspiring, and can sometimes begin to influence your life on the same level and intensity that memories do. And this track does just that. It makes you feel like you’re dreaming…in reality.